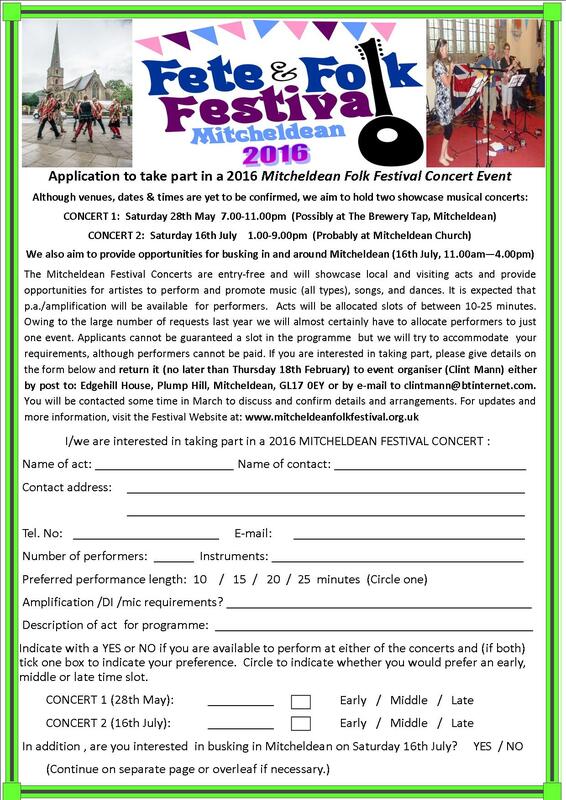 It’s time to start planning for the 2016 Mitcheldean Folk Festival! Your committee has met and can confirm that the dates for the main events will be Friday 15th July – Sunday 17th July – as usual the third weekend in July. We have already had enquiries from people who would like to perform in the showcase concerts, so we’ve posted a provisional application form here so that you can download it and send us your details. Although the arrangements are yet to be finalised, we’re aiming to hold (as with last year), a Pre-Festival Concert at the Brewery Tap on Saturday 28th May (7.00-11.00pm), with the Main Festival Concert running over eight hours in Mitcheldean Church on Saturday 16th July (1.00-9.00pm). We also are hoping to having opportunities for busking in and around Mitcheldean on the Saturday when the Fete is taking place. 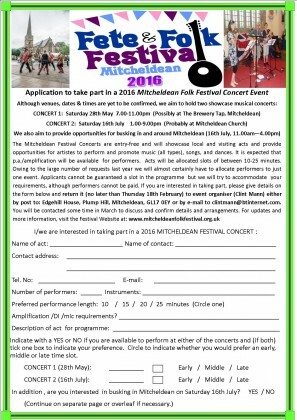 To apply, send in your application form either by post to: Clint Mann, Edgehill House, Plump Hill, Mitcheldean, Gloucestershire GL17 0EY or by e-mail to: clintmann@btinternet.com You can also hand in your form during the meetings of Mitcheldean Folk Club (in the White Horse on the 2nd Thursday of each month) where forms will also be available between December – February. Hurry though – we need all applications in by no later than Thursday 18th February, 2016. As well as these concert events, there will be all sorts of other things going on, including the Fete, the Poetry afternoon, the Sunday Folk Walk, music sessions in the evenings and a Barn Dance. So – watch this space for further details.